An English accent in New Zealand nearly always begs the question How long have you been here? and when you tell people nine months it then usually comes with another set of questions Why did you come? Do you like it? Are you going to stay? So after living and working in New Zealand for nine months I feel that I can honestly answer all three. 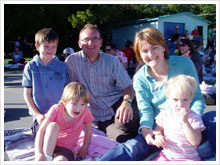 My family and I (husband Russell and three children Gregory 10, Darcy 4 and Scarlett 3) arrived in New Zealand on 30 September 2006. It was the start of a big adventure that had first come to into our thoughts in the summer of 2005. We emigrated via the skilled migrant category and with my job offer in the city of Wellington, we had come up with a hazy plan of living in the Hutt Valley as this was a reasonable commute into work. After two weeks of living in a holiday park, we found a place to rent and set about finding our feet. So why did we come? We were drawn by the lifestyle, improved life chances for our children, the sense of space and more. Yet despite being both reasonably sensible people we were driven too by the reckless spirit of adventure, the challenges of living and working on the other side of the world and the chance to add a new and exciting chapter in our lives. So you could say that for the large part we came on a whim. Our early success criteria were for the children to be happy, to be in jobs that we enjoyed without being all consuming, to have a pleasant lifestyle and to buy a nice house with plenty of space that offered different attributes to those we enjoyed in the UK. Our nine month report therefore gives us grounds to feel encouraged. The children are settled particularly Gregory who quickly made friends and became a kiwi-kid shocking his Grandparents on the phone with his new accent. Darcy and Scarlett attend a pre-school which I have to say is better than the one they attended in the UK, we are impressed by the commitment to early education and the government has now brought in a subsidy which helps working parents such as ourselves. On 1 March this year we bought our new house, a place we could only have dreamed of having back in the UK, with views across the Hutt Valley and out to Wellington Harbour that I am sure will continue to amaze us for some time. The process of buying the house was very different to that of the UK, the whole thing completed in three weeks! We are enjoying living in the Hutt Valley and find Wellington to be a fantastic, vibrant and thoroughly pleasant city. My working life started two weeks after we arrived in New Zealand at Wakefield Hospital in the heart of Wellington. Wakefield is one of the largest private Hospitals in Wellington but having only been interviewed over the phone I was unsure what I was coming to. I was very pleasantly surprised to find a very professional and friendly group of people who were as pleased to see me as I was to see them! After becoming increasingly disillusioned with the NHS before I left I felt that I had truly landed on my feet. To compare it to the NHS would be unfair, however the processes of nursing are very similar, they understand the same nursing jargon and strive for excellence in nursing practice. Working in a Private Hospital allows you to work at a different pace to that of the NHS, to give time to people and most importantly for me, to feel like I was nursing people properly. It is also a job that I feel challenged by and I am constantly learning new things. Having always said that Surgical Nursing was my first love its a pleasure to be nursing in such a nice environment. I rarely go home exhausted and never dread getting out of bed in the morning. Russell secured work in February 2007 having assumed the role of House husband while I was the breadwinner in the early days of getting here. He is also working in a job that he enjoys and feels challenged by. We had no grudge with the UK before we left. New Zealand is not the UK in any shape of form, which is just as well having moved 12,000 miles for more of the same old same old would have been something of a disappointment. New Zealand has given us a chance, and everyone we have met from day one has been welcoming and hospitable- sometimes unbelievably so. So are we going to stay? We feel so positive about our new life and experiences that I have to say yes – although you can never predict the future, we would really like to make this our home. We are very happy with our new life in NZ and particularly for ending up in Wellington, a fact we have to thank Tonix Health Recruitment for!